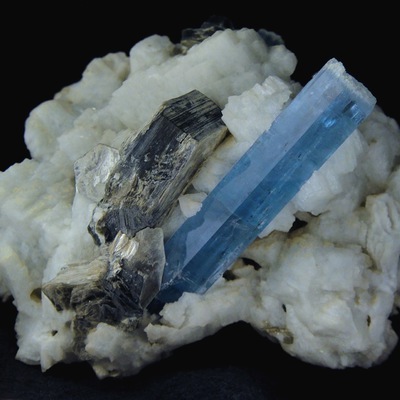 Maxixe Beryl is a variety of beryl that has a bright or dark blue colour. The colour gradually fades in daylight to a brown-yellow colour, which diminishes its value as a gemstone. Originally (since 1917) it came only from the Maxixe Mine in Minas Gerais (Brazil). 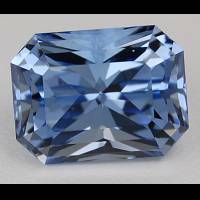 More recently beryl from multiple sources has been sold as 'Maxixe', which has lead to many in gemmological circles preferring to use the terms 'Blue Beryl' or 'Maxixe-type beryl'. Since the 1970s it has been more widely available and enhanced through irradiation, but the colour fades after prolonged exposure to light or heat although it is much slower with indoor lighting. This table shows distribution of Blue Beryl (Maxixe) gemstone sizes that are listed on this site. This can give a good indication as to the general availability of this gemstone in different sizes. 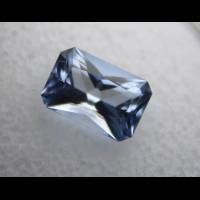 Do you have a larger Blue Beryl (Maxixe)? Why not upload a photo? Strong dichroism: blue to colourless.